One hundred issues and three and a half years later, we thank everyone who helped make the Erie Reader the publication it is today. We couldn't have done it without you. The Erie Reader founding team. "Journalism will kill you," Horace Greeley once said, "but it will keep you alive while you're at it." Greeley — on his rise to fame in both the publishing and political worlds — worked as a printer for the Erie Gazette before leaving for New York City in 1831 to eventually launch the New York Tribune. 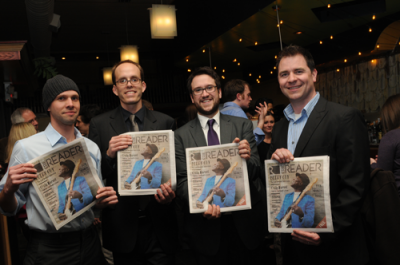 After publishing one-hundred issues of the Erie Reader, we're glad to say that our place in journalism has kept us very much alive, and after three and a half years, we're looking forward to many more years of working in this ever-evolving medium. Before we launched in the spring of 2011, Erie had no alternative voice seated at its media table. With that observation in mind, we set out to create an independent alt. weekly-style publication that would serve as an additional forum for ideas as well as a publication that would actively drive discussion. We credit our success to date — and the reason we're able to look back through the ninety-nine issues before this one with pride — to the strength of those contributing to our publication. From the talented editors and writers who shape the content you read, to those throughout the community who continue to support our mission, it is evident that people believe in the need for this kind of voice in Erie. We do not take our job lightly, as we know that with it comes a great responsibility to our craft, our audience, and our character. Greeley also once said that while "fame is a vapor, popularity an accident" and that "riches take wings," the one thing that "endures is character." Our integrity and how that shapes our character as part of the Erie media landscape matters the most to us. We have been — and shall remain — committed to reporting the Truth in an effort to keep you informed, offering well-reasoned opinion to provoke conversation, and providing extensive coverage of Erie's vibrant arts and culture scene to highlight the rich resources within our city. We do not take for granted the role we play in telling Erie's story, because what continues to be our priority as a publication is the progress of the city and region we choose to live in and build a business in. Thank you for all of your support, your criticism, and your encouragement; onward and upward and into the future we push.